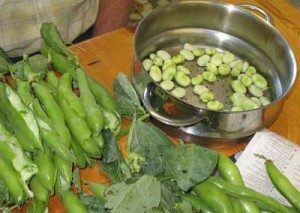 There are two schools of thought on how to freeze broad beans – some people blanch the beans before freezing and some don’t. Blanching involves plunging the beans into boiling water to stop all enzyme activity in the beans, so the beans stay exactly as they are without any deterioration. Therefore, the healthy vitamins and minerals will remain in the beans. After a couple of minutes at boiling point, the beans are dropped into ice-cold water, to stop the cooking process. It is worth trying both methods, to decide how to freeze broad beans to suit yourself.